What can I use the Tick Files for? The tick files show all prices that were streamed to your terminal during the time of a release. 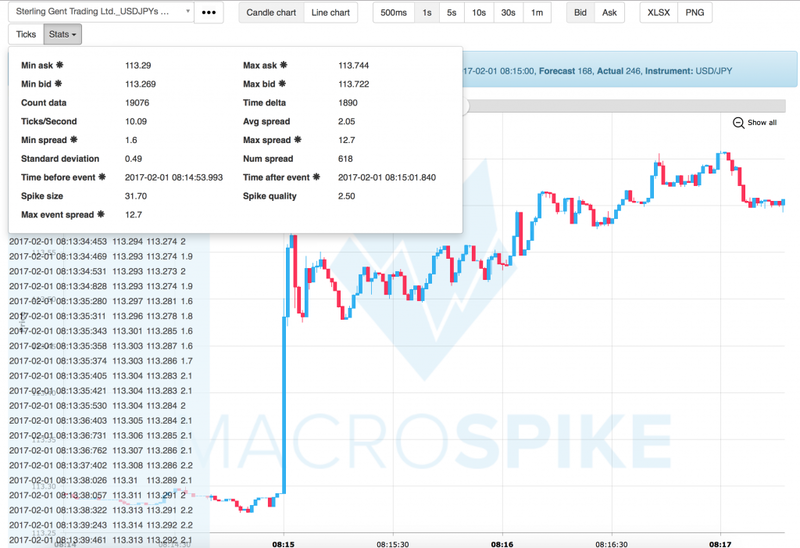 We developed MacroCharts for users to upload their own tick files and analyze their broker’s price feed in detail. Open http://charts.macrospike.com/charts and click on ‘Select File for Upload’ or simply drag and drop your files onto the browser window to upload your tick files to the DB. How do I select the right point size for the FX BOLT EA? What is the difference between FXBolt EA and ALT FXBoltEA? Where do I find the Triggers for an event? Can I use separate lot sizes for every Trigger? What is ReverseTriggers used for? What is Level1 and Level2 used for? Can I use different strategies for Buy and Sell of the same instrument? Can I use a buy-only / sell-only approach to trade an economic event? What are the parameters MaxSpread and MaxPrespike used for? Can I use multiple EAs on one terminal? How do the tick charts work? How do the different Stop and Close conditions work? If several stop conditions are triggered simultaneously, how does the EA determine which one to use? What if the EA fails to adjust my Stop Loss? How does Spike Start SL work? Where can I find my tick files? Can I disable tick recording? Is there a MSTimer setting for the FX BOLT EA? How does scheduling trades work? I would like to use the EA at a time when there is no scheduled event. Is that possible? I received a signal but there is no open position. Why? The MacroTrader EA is not attached to a chart. I am shown an empty chart window instead. How does the Retracement EA work? 02 What do the different parameters for the Retracement EA mean? How do the Entry, SL and TP parameter in Retracement EA work? Can I use the interface after the DeleteTime timer is over? What's the difference between Use Absolute Prices true and false? 01 How does the Fader EA work? My order wasn’t placed and I received an Invalid SL and TP message. What happened? What is a Straddle Strategy? What do the different parameters mean? How do I select the right point size for MacroStraddle? How do MaxSpread and MaxSlippage work? I am receiving an ‘Default instrument not found’ message when I try to add my terminal?